Bathroom renovations can be a difficult job, although there are ways to make it less expensive as well as saving time. Regardless of the reason for doing this job, it is a job worth doing well and can add a good deal of character to the home – to say nothing of pushing up the price if the house is put onto the market. At the planning stage of the bathroom renovation, you need to consider who the work is being carried out for. Does the family prefer a bath or a shower under the modern shower system, do they spend a lot of time in the bathroom, are there any disabilities to consider and are you likely to want this to be a one-off change or will you be upgrading on a regular basis? The amount of light that comes in needs to be considered as often make-up is applied in a bathroom and it is the normal place to shave. In the same way that an outstanding bathroom can add to the value of a house, an unusual bathroom may limit the offers made if the house is ever put up for sale. First of all, make checks about the way the house was built. You don’t want to pull half of the bathroom out and then find that there is asbestos in place. If this does happen it will mean a specialist has to be called in as they will be able to remove it and dispose of it in a safe and secure manner. Regardless of asbestos, think about injuries that can be sustained and make sure the correct safety equipment is purchased. This will normally mean overall, goggles, dust masks and thick gloves in case you are going to be cutting pipes or wood. 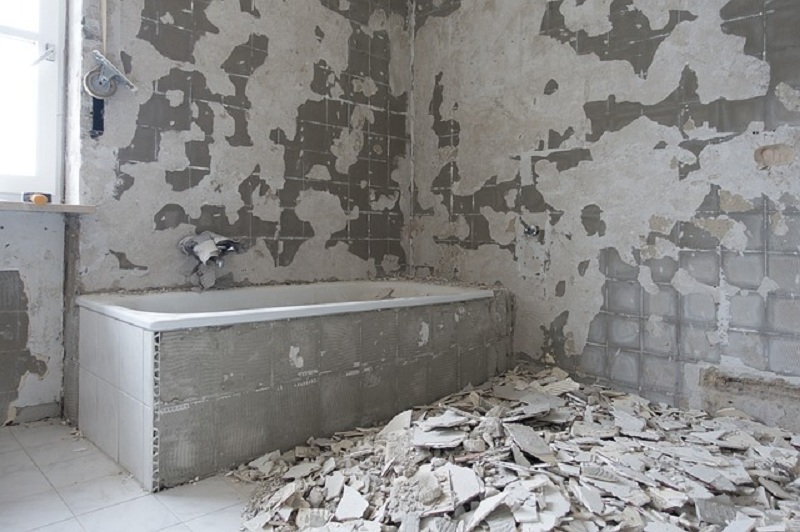 Often local authorities will have rules and regulations regarding what can and cannot be done when undertaking bathroom renovations, so make sure the work is cleared with them and any conditions are adhered to. They have the authority to have the work stopped and the building returned to its original condition. To get the basics in place, any electrical work or plumbing should be carried out first. It would be pointless to carry out tiling or put down an amazing wooden floor and then find that it needed to be removed to carry out work behind the tiles or under the floor. One of the big issues with renovating bathrooms is getting the basics right. Making sure that the bathroom is waterproof is very important and the areas to concentrate on are the floor around the bath and the shower. Don’t try to save money by only waterproofing a small amount as it is estimated that the waterproofing should reach 10cms up the wall. The same distance should be covered above the shower outlet and when it comes to the bath, 10cm above the lip. Doing this is not difficult but can save disaster later on. When replacing tiles it is important to make sure that the floor is completely flat. Any cement that is damaged when the old ones are taken up should be corrected right away. Don’t try and rush things by putting the tiles down right away, but make sure that the cement has fully set. One of the jobs that can be left to the end of the bathroom renovation is fitting the taps and any other small bits and pieces such as toothbrush holders and racks that can be placed inside the shower cubicle to hold gels and sponges. Taps will be vital, but the other holders can be missed out altogether if the budget has gone – it would not take a great deal of time to add them at a later date. Some people will leave items such as painting the ceiling until the end, and there are good and bad points for this. 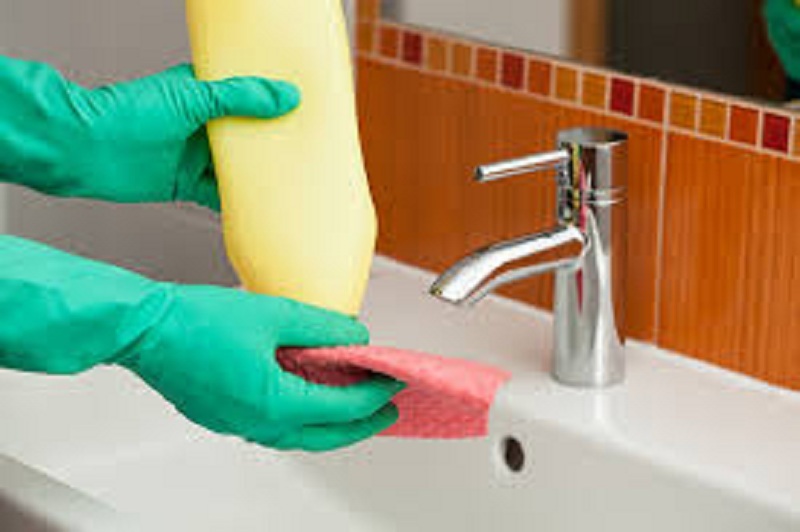 As with the gel holders it is a job that can be left for a later date, but there is also the risk that the paint may be spilled or drip onto the new floor covering or bath and shower cubicle. Once the bathroom renovation has been completed, it should be a long time before you have to spend money and carry out further improvements and changes. If you can help it, you should go for solutions that employ the least grout to pull off. Solid surfaces are a good example, as having no grout and fewer lines of that kind will allow you to handle house cleaning in the future with less fuss. Stone slabs for example will have their own seam lines, but by comparison to the usual tiles used in bathrooms they will be far smaller and thus easier to clean and sanitize. Fewer areas with grout mean a much smaller chance at nigh-impossible to clean mold, so consider this solution as you move forward. The use of Caesar stone can also become a nice and classy solution you can count on. It will give the walls of your bathroom a really nice look while at the same time possessing the same advantages as those mentioned above for stone slabs. Using it will allow you to handle the design with easy cleaning in minds. Vinyl surfaces can also be used around the bathroom to great effect, as they have almost no seams and are waterproof to boot. The wider variety of colors you can use as well as different textures will allow you to have a lot to work with for a really easy cleaning and a wonderful look. 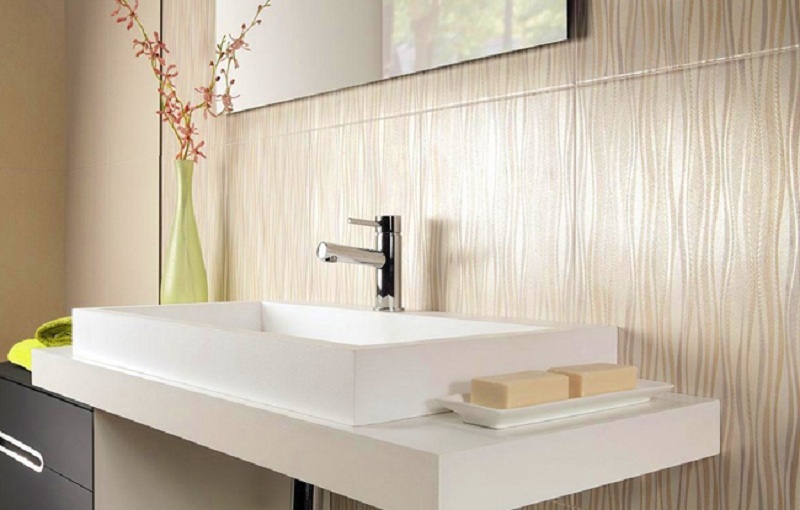 You can also make use of back-painted glass for your walls as well as counters in the bathroom. If you have a small bathroom this will be an excellent solution to make it count and appear slightly larger than it already is. There are areas around the walls you can still keep from being tiled instead making use of other solutions such as paint. High moisture levels in the bathroom mean you will need to work with a paint specifically made to resist such conditions. This will keep you from facing mold and mildew and cleaning them far too often. Combining this with good air conditioning to reduce excess moisture will help in the long run. Look for a ventilation solution such as a dehumidifier if you think the bathroom will see too much in terms of hot and humid days. This will really help keep unpleasant smells out and the entire bathroom looking and feeling fresh. Making use of larger tiles when you want to use tiling will ensure fewer grout lines in the design and a cleaning solution ( How to Getting Your Home Ready for Winter ) that will be far easier by comparison. This will work quite well with the right approach and preparation, so make a plan and stick to it. How to Make The Bathroom Spacious? You might all be well-acquainted with this fact that bathrooms form the tiniest part of your place. They might not get a huge response from the homeowners, but they tend to be very important. For most of the residential units, bathrooms are pretty small. You have to work hard to add some extra storage within that tiny space, just to accommodate all your needful toiletries. However, with the help of Bathroom Stores, you will be able to store all your necessities in the most proficient manner. Everything will be kept intact under one platform, without facing any problem. Well, little renovations can be done inside your toilet, but that will not extend the space you already have. However, the wall just above the toilet is quite precious to store items intact. You can add your Bathroom Stores over there, as the toilet floor is already occupied with bathtubs and more. These toilet units are extremely popular among the masses for various reasons. Available in different shapes and sizes, these toilet space savers are currently available at affordable rates. You can spend less to get more! Further, you can get these space savers of various material that can be plastic or metal, or even a perfect combination of plastic and glass. Now, you might have a question, popping up in your mind. What are the reasons to use Bathroom Stores? Well, the main reason is that in smaller bathrooms, you have no other option but to use toilet space savers! There are some other advantages, which might grab your attention. In case, your Bathroom is having any toilet fixture, these stores are the best ways to camouflage it. Your guests will never find those fixtures! A bathroom store with glass top can serve two functions, at the same time. It not only helps in storing everything in one place but also give users the opportunity to check them, before leaving the bathroom. If you are an organized person, this store is just meant for you. Store all your necessary items in one place, and it will not be hard to get them when you are late. You do not have to restrict yourself by adding a just one-bathroom store. If you have spacious walls inside a bathroom, you can mount two or even three toilet space savers on the wall. The more you have; the more space you can enjoy! Apart from the benefits mentioned, there are some tips, which you must listen to, first. Well, you cannot just invest money in any product, which is not within your limit. You must check the price of these space savers first before you plan to invest in them. As they are available at different prices, therefore; finding one, which you like, is not going to be a tough decision. You better check the decor of your bathroom, before choosing the storage. 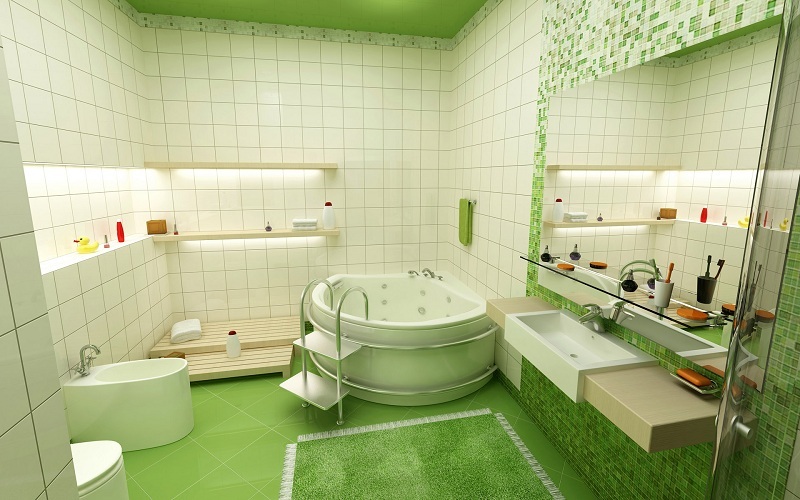 For example, if you have a spacious contemporary bathroom with bathtub, then plastic storage units will look a disaster. Please be specific about the storage you want in these stores. Are you willing to store only the daily toiletries, or something more? Depending on the requirement, the prices are likely to vary. Make sure to follow these points first, before you choose them for your use. These points are enough to help you in selecting the best bathroom store which saves your money and invest in the best suitable product for your bathroom. Now storing items is not a messy stuff, anymore! Having leisure time can be utilized to arrange our furniture. We could initiate it by adjusting the l-shaped wooden vanity cabinets being brand new. There are several glass shutter windows treatment types and fresh bathroom interior furnishing mahogany wood vanity which can be chosen. 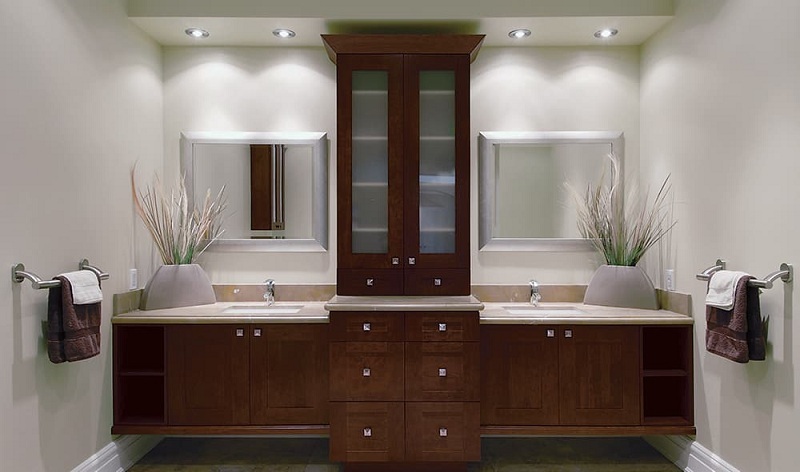 However, I’m so interested with decorating featured mahogany wood floating vanity cabinets also oval wall sconce decor. Yeah, it’s incredible indeed. 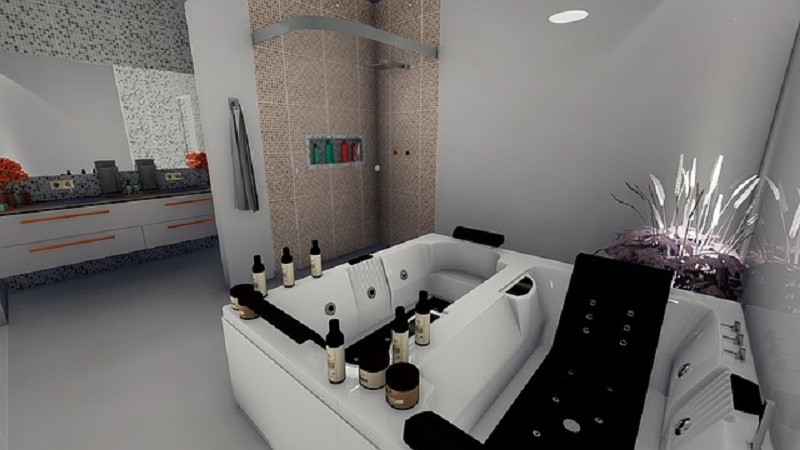 I have picked up some small bathroom complete concepts of it in this blog post below. You can certainly see dazzling creamy theme wall bathroom or towel rack underneath with the help of this page below such as the development in master wall mirror etched. You can also see the style in white concept with open towel rack underneath or round marble sink. When you still want a lot more white bowl sink concepts, I could discuss the design with freestanding bathtub set and stainless steel curved faucet. Are you looking for an organic topic? Possibly the type with brilliant bathroom interior furnishing cream marble countertop on hardwood vanity cabinets or Paloma theme wall bathroom can be the excellent suggestion for you. Wow, it is the mosaic wall decor creation which excites you, isn’t it? Presently, it is your time to take the picture above from this post gallery together with electric towel warmer put on into your furniture quickly. appreciate.